Posted: September 1, 2015 Written by: W.B. “Bud” Kirchner. 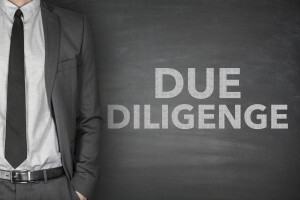 One of the most universal techniques in business is due diligence. We all use it prior to adding new clients or suppliers and in investing in new companies and new relationships. However, what is not universal is the order of the process. Most typically in a business transaction, due diligence of people is a later stage. This often comes after extensive financial investigation into things such as earnings and pro formas. At Kirchner Group, we do the opposite (I find myself saying this quite a bit!). For us, due diligence of people is essentially the first step. This in no way implies we aren’t intense about numbers, plans etc. but the financials follow the people. The format I prefer for people based due diligence is a one-on-one dinner (ideally this will include wine) where the agenda is – no agenda. AND there are no notes taken! I want this to be a relaxed event where I can see the true person. Often people are compelled to act a certain way when in a work environment or a formal environment and I don’t want to see their acting. I want to see the person as they really are rather than seeing them acting as who they think they are. Why is this important? One of the few absolutes in business is that no plan will unfold as drafted and I need to know 1) Will they get up one more time? 2) Will I believe their explanation of what happened? So when (not if) a plan derails I must be able to count on them to make that difficult phone call, be honest with the details and propose a Plan B. Who would have thought Henry Wadsworth Longfellow had something to say about this? Anyway, consistent with his words, I want to understand both perspectives. The Kirchner Group process integrates many aspects of our Business Brain Model. This method includes various forms of communications (non-verbal) and subconscious (emotional) impressions because much is revealed about the true person when you are able to see the unseen and hear the unsaid. As head of the Kirchner Group I pride myself in our due diligence and our judgment across every aspect of the company. As head of the Kirchner Group I pride myself in our due diligence and our judgment across every aspect of the company. We provide advisory, diagnostic, M&A and operational services, among others and yes, we perform extreme due diligence in each area. We even co-developed a specific new offering called ‘New Diligence’. In one of our businesses, we are involved with buying and taking control of portfolios of companies. Sometimes this involves 5 to 25 companies – all of which need to be diligenced (I know it is a made up word) before proceeding. Recently Crestline-Kirchner, L.P. took over as investment manager for Medley Opportunity Fund Ltd. (now known as CK Pearl Fund Ltd.). But rather than dealing with a large number of companies, this involved a large number of individuals. That is a scale very few groups would work at and that is what sets us apart in the business world. We are credited with pioneering what is called the ‘Portfolio Rehabilitation Model’ which begins with due diligence of people. I can unequivocally tell you our success is largely based on the fact we start with people. Another area we are involved in extensive due diligence is in our merger and acquisition (M&A) business. Whether our clients engage us on a “buy” or a “sell” mandate we encourage them to recognize due diligence as a priority. We work with clients to be sure they understand the importance of having a candid, honest commentary focused on values no matter their position. How self-aware is this person? Are they passionate about themselves or their business? What parts of the job are they best or worst suited for? What culture is most conducive to their performance? That is a quote that I find humorous because it doesn’t have to be that way if you are willing to put in the time – the due diligence. When I do my due diligence with a person it is sometimes a long event but by the end of our time together I feel that I either know the person or I know I don’t want to.